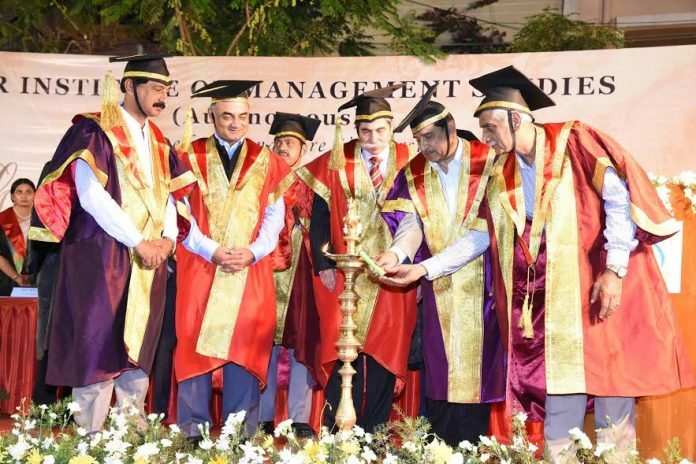 Bengaluru: CMR Institute of Management Studies celebrated its Graduation Day with honour and pride in the college campus. It was that time of the academic year where the vision of the Institution is realized in the students who are ready to initiate their lives in the real world. The campus brimmed with the hopes, dreams and aspirations of the graduating students. Over six hundred students from various Under Graduate and Post Graduate programmes were graduating. The ecstatic parents along with the students were excited to be at the threshold of a new chapter in their lives. Prof. Suja Bennet, Principal, CMR IMS welcomed the gathering with pride. She stated the importance of the graduation ceremony in the lives of the young achievers and appreciated their parent’s efforts and contributions to their success. Adithya Menon, President of the Student Council and Zoya Zharlast, an Afghani student reminisced over the didactic years spent in the college, their hopes and dreams for the future and urged their fellow graduates to never lose hope even when the road ahead becomes rough. Mr. Rupam Mazumdar, Director and Co-Founder of Spintlr Labs Pvt. Ltd. a distinguished Alumnus of the college addressed the students and shared with them the advantages of a privileged education and prompted them to utilize their knowledge for the betterment of our society. He emphasized that the passion and the courage to pursue their dreams makes all the difference in the world. Academic toppers were felicitated for their diligent effort and achievements by the dignitaries. The Chief Guest, Shri. Rupak Kumar Dutta, I.P.S., Director General & Inspector General of Police, Karnataka addressed the gathering. He motivated the students to dream big with passion, honour and confidence and assured them that success will follow in the footsteps of integrity. Shri. K. C. Ramamurthy, I.P.S, Member of Parliament, Rajya Sabha, Former Inspector General of Police, Chairman, CMR Group of Institutions administered the Graduation Oath to the students. The Guest of Honour Shri. Shereyar D. Vakil, Former MD, General Electric, Bangalore addressed the students and reminded them not to lose their humanity when they get into professionalism by the corporate world. He recommended that the recipe for success and good management is to replace competition with collaboration. Shri. K. C. Ramamurthy, I.P.S, Member of Parliament, Rajya Sabha, Former Inspector General of Police, Chairman, CMR Group of Institutions gave the presidential remarks. He applauded the faculty for being an integral part of every student’s life and encouraged the graduating students to be a part of the alumnus which will raise the credibility of the institution. The day was concluded by the Vote of Thanks by Prof. S.G. Mukherjee, Dean, Management and Commerce department, on a high note congratulating the students for their commendable achievements. The college choir ‘Resonance’ added a touch of musical delight and the song “Raise me up” lifted the spirits of every student to aim for the stars. The exuberating moment bore testimony to the fruitful culmination of the industrious educational journey the student’s whole heartedly embarked upon. The distinguished guests who were part of the programme were Dr. Raju Reddy, Trustee, CMR Jnanadhara Trust, Shri K. C. Jagannath Reddy, Secretary CMR Jnanadhara Trust, Dr. Bhaskar Reddy, Director CMR Group of Institutions, Prof. S.K. 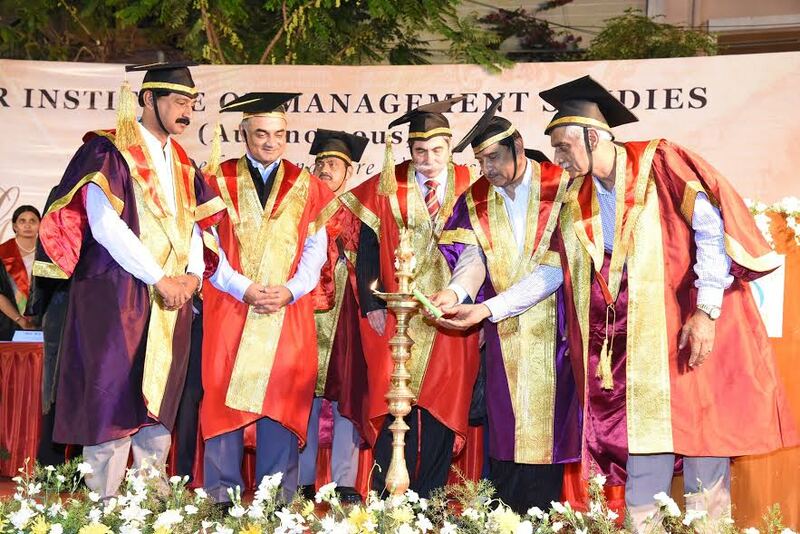 Balaraman, IGP(Retd), Director, Examinations, System & Security, CMR Group of Institutions & Registrar(Evaluation), CMR University, Dr. Praveen R., Registrar, CMR University, Dr. Rishikesh, Director CMR CBS, Prof. Ravi Chandar, Director CMR LSI and Captain Dr. Anandappa, Vice Principal, CMR IMS.